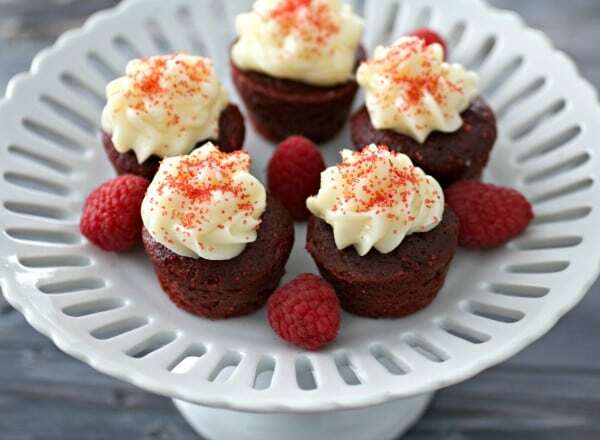 A Mini Red Velvet Cupcakes Recipe that’s perfect anytime you are craving a red velvet cake, without baking a whole cake. These easy chocolate cupcakes are topped with a cream cheese frosting and ready to eat in 30 minutes! 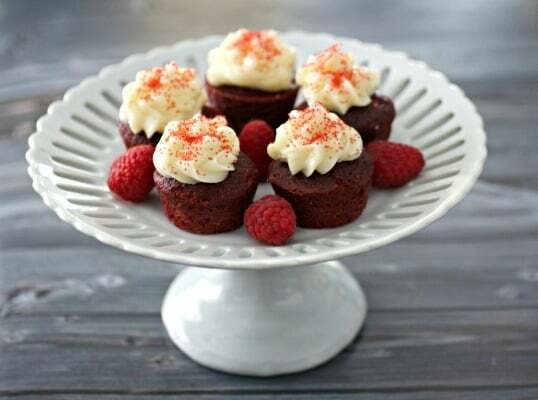 Valentine’s Day is this weekend and I am beyond excited, not only for the holiday but also to share this delicious Mini Red Velvet Cupcakes recipe! I found this recipe from a fellow Food Blogger, Sharon at SavorMania. Once I saw a gorgeous photo of these Mini Red Velvet Cupcakes on Twitter, I knew I had to make them soon. And by soon, I mean the next day. 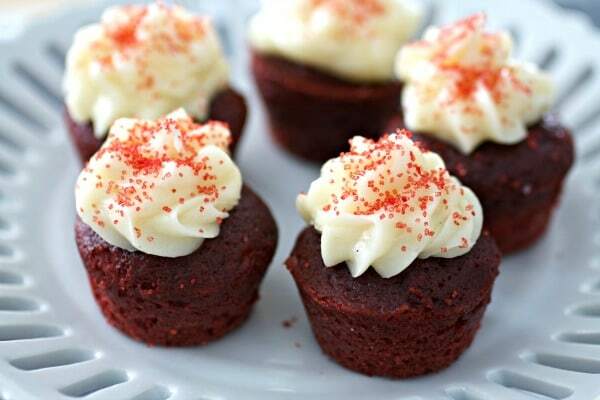 Red velvet is one of my favorite desserts. Having grown up in the South, this confection was a tradition served at every family gathering. I’ve always adored the moist, sweet, and lightly flavored cake with hints of chocolate and vanilla. These cupcakes are not too sweet, have a little more cocoa than the norm (more chocolate is always a winner in my book), and the plain yogurt adds extra moistness. The recipe was so easy! It took no time at all to mix the batter together and bake off these homemade cupcakes. Plus the mini size is so cute and cuddly and that you’ll want to eat 20 of them in one sitting. 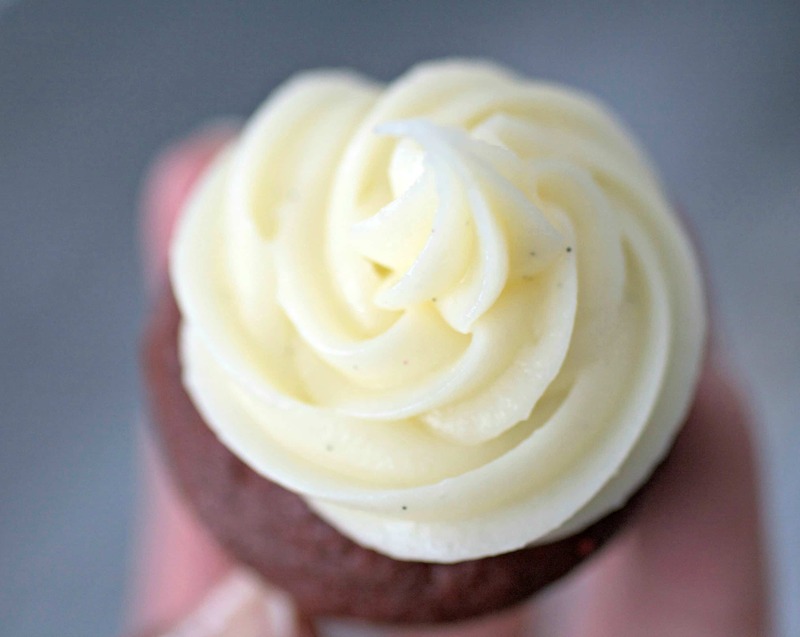 Vanilla frosting or cream cheese frosting recipe? I didn’t change the original recipe ingredients for the cake, but I did mix the batter together differently (as noted below). Also, I changed the frosting from vanilla to a cream cheese recipe. Aside from chocolate ganache, cream cheese frosting is one of my all-time favorites and is perfect on red velvet cake. I want you to know, I have no restraint when it comes to cupcakes. Right after this photo was taken, I ate 4 out of the 5 cupcakes shown below. I left one on the plate, along with the raspberries, because I didn’t want to look greedy. Whatever, there were still 20 left for dessert later. 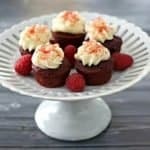 Make this easy and delicious Mini Red Velvet Cupcakes recipe next time you want a chocolate snack. PIN it later for Valentine’s Day or anytime you want to make cupcakes! 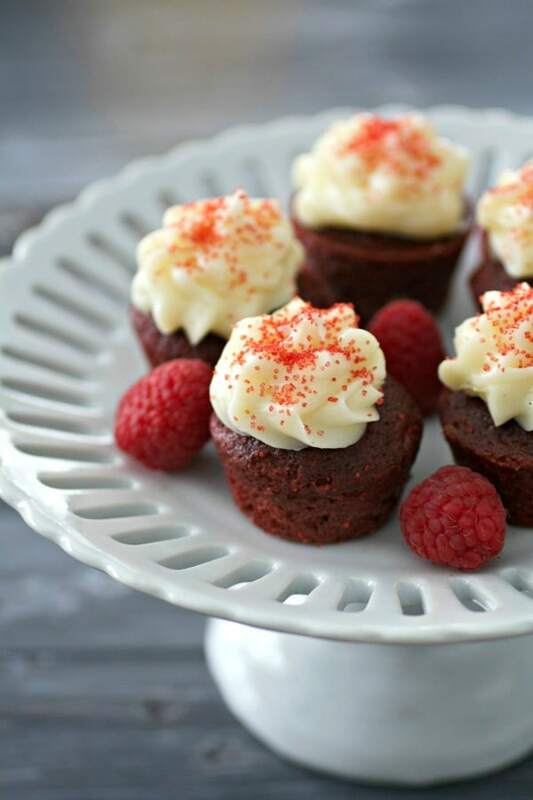 This Mini Red Velvet Cupcakes Recipe is perfect anytime you are craving a red velvet cake. These easy chocolate cupcakes are topped with a cream cheese frosting and ready to eat in less than 30 minutes! Preheat oven to 350F/176C degrees. Grease and flour a mini muffin/cupcake pan and set aside. In a large bowl using a stand-up mixer or hand mixer, beat together the butter and sugar on high speed until fluffy and creamy, about 3-5 minutes. Add the eggs, one at a time, and beat until mixture is pale yellow in color. Add vanilla extract, red food coloring, and cocoa to mixture and mix until well incorporated. Set aside. In a separate small bowl, whisk together the milk, yogurt, and cider vinegar. Set aside. Add the milk/yogurt mixture and the flour mixture to the butter mixture, alternating between the two and mixing well after each addition. In a separate medium bowl, sift together flour and baking soda. Fill mini muffin cups 3/4 from the top and bake for 10-12 minutes. Let cool for a few minutes in the pan, then remove and let cool completely on wire rack. In a small bowl, mix together all ingredients until thoroughly blended. Frost the cooled cupcakes with the frosting. I love red velvet.. so I am craving one of these little cupcakes right now. They are the perfect bite sized treat! 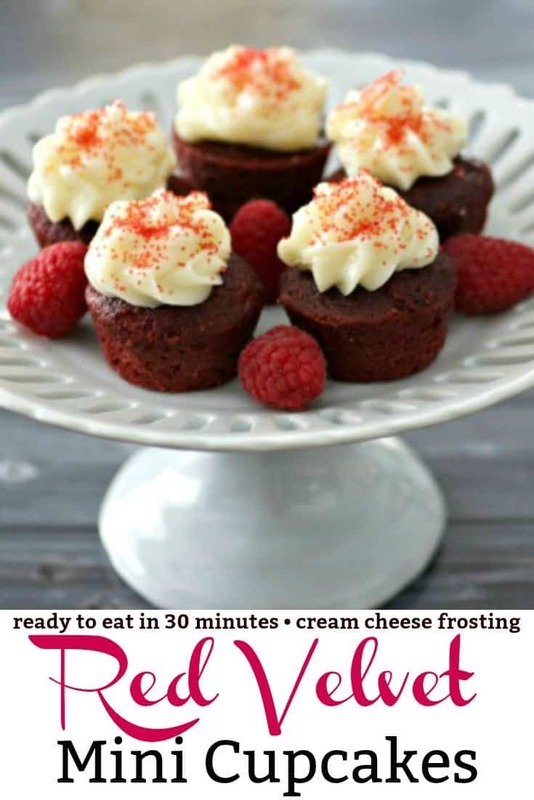 I’m so in love with red velvet cake…and cream cheese frosting. As soon as I eat all the cupcakes up, I want to make more! My bad. Just made these little cupcakes for a luncheon later this week.. YUM! Needed 48 so thought I’d have to do 2 batches. 1 recipe made all 48, 3/4 cup filled cupcakes – perfect! Hi Venus, Mini cupcake pans normally use 3/4 ounce liners, so I would start with that size and see if they fit your pan. Hope you like the recipe! 124 calories in one mini cupcake or in 24? It’s for 2 mini cupcakes.